I often wonder what it is that Clint Eastwood eats for breakfast, lunch, and dinner. I wonder what his daily routine is like, his morning workout programme is about. I wonder what kinds of books he reads, the kinds of movies he watches (of course), the kind of…things he would do to occupy his time everyday. I wonder about all of these and more because it seems that there is not a year that goes by without a poster proudly adorning the words ‘A film by Clint Eastwood’ somewhere in the world. Most people would be hard-pressed to make one or two films that are truly memorable. Look no further than Kathryn Bigelow, one of the frontrunner for this year’s Oscars, who spent years making movies without ever truly rising to where she is now. Does that mean that she’s suddenly a better director than she was all those years ago? Perhaps not. Perhaps a bigger part of how talented someone is has just as much to do with timing. With that in mind, Clint Eastwood, Oscar darling, all-round good guy and Hollywood legend, has managed to play this game down to a tee. In a good year, he might even be bothered to make more than one film. Hell, he might even cast himself as the lead actor. 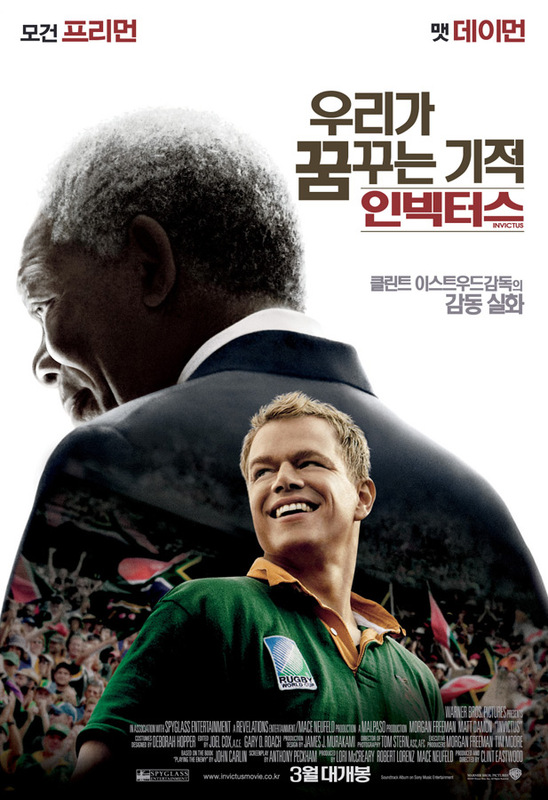 ‘Invictus’ follows the life of Nelson Mandela (Morgan Freeman). The year is 1994, and he had just risen to power and taken office on the back of the end of the apartheid. Winning on the political front, and actually winning on the streets, however, can be two different things. In this movie, Nelson Mandela seeks to bridge the divide between the two. It just so happens that the rugby world for 1995 was to be held in South Africa that year, and though he wasn’t a rugby fan to begin with, he recognises that the performance of the Springboks (the nickname of the South African rugby team) is crucial to uniting the nation. 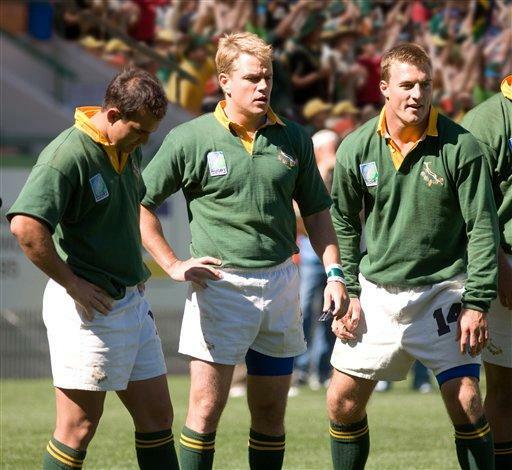 Key to this plan of his would be the captain of the Springboks, Francois Pienaar (Matt Damon), a young man whose problems includes the Sprinboks being taken to the cleaners, hung dry and made to pay for their own bills each time they step unto the field. With the team being mainly composed of white African players, the African fans actually boo their own teams, not merely for being somewhat-rubbish, but for being seen as representing all that is wrong with the apartheid regime. Francois also faces a reverse of this situation at home, with his father being especially against Mandela’s presidency. Of course, that is the moment that Mandela chooses to invite Pienaar for a chat at his office. There, he shared with him a poem that he used for inspiration called ‘Invictus’ by William Ernest Henley. Pienaar becomes predictably inspired, and together the both of them tried to do what they can to unite the nation. "I'm sorry, Matt. I don't know where your watch is, either." Sounds all very Hollywood, doesn’t it? If anything, there is a very classic Hollywood feel to the whole thing. Classic in terms of style and colour. Sure, this can be considered as a period film, but instead of feeling like a movie set during my high school years, the colour and the music inspires feelings of a time when I was merely a dirty little thought in my father’s mind (having said that, what’s with the pop song that suddenly made itself known halfway through the film? Perhaps a sign of overdoing it, Mr. Eastwood?). Classic, also, is the clear and direct preaching of Mandela for peace, tolerance and understanding. “This is no time to celebrate petty revenge. This is the time to build our nation, using every brick possible, even if it is wrapped in green and gold.” Such grand claims are meant to inspire, but it also conjured images of the sugar-coated reality that Hollywood has constantly been claimed of offering by the spades. In fact, in real life, apparently Mandela didn’t actually quote the poem, but used instead a part of a speech by American president Theodore Roosevelt (having said that, I don’t think ‘The Man in the Arena’ has quite the same impact as a movie title compared to ‘Invictus’. And now that I thought about it, it may well have been in the foreword of Kurt Angle’s biography as well). Therein lies a big part of the issue. This film itself is not an adaptation of actual life; rather, it is based on a book called ‘Playing the Enemy: Nelson Mandela And The Game That Changed a Nation’ by John Carlin. That book itself looks only at this particular juncture in Mandela’s life, and so this must be borne in mind when you watch the film. 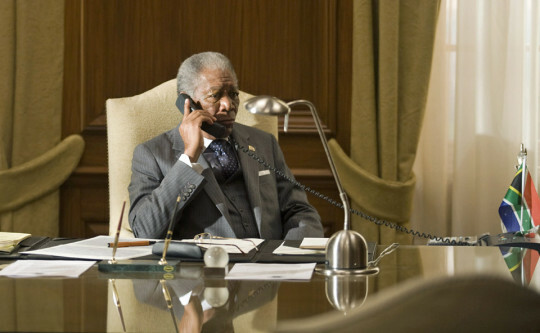 Of course, it had the blessing of the original Nelson himself, and I have to admit that Morgan Freeman is Mandela. You know how when the ‘X-Men’ movie was first announced, and you realised that the only actor possible who could play Professor X was Patrick Stewart? Of course, other actors could step up to the role, but you might end up thinking, “Yeah, but Patrick Stewart might have taken it up a notch…” In this case, Morgan Freeman took that notch to as high a level as humanly possible. His speech inflections, his body language, all of it precisely mirrored what I recalled of the former South African president . I am less familiar with Francois Pienaar, not being a big fan of rugby myself. In fact, my memories of rugby consists of me being squished to bits. While I wouldn’t quite put Matt Damon’s performance here on the same level, I do wonder what made people consider his to be a ‘Top 5 Supporting Performances of the Year’. I have no doubt, however, that he worked hard on this, and it is not to say that I wasn’t impressed…it’s just that I’m not that impressed. All the more so, considering that between the two of them, his is the role more closely identified with that of the protagonist (despite him not being the first name on the poster). His is the character who is supposed to change, slowly but surely, throughout the movie. It is a change that I had to look hard for. The locations and cast were drastically different for 'Ocean's 14'. Morgan Freeman aside, the other strength of this film is the visualisations of the strife and conflict that South Africans must have faced during that time. We see this from the very first frames of the film, when a road divides a group of dark-skinned children playing football and white Africans going through the motions of a rugby practice session. Then a motorcade carrying Mandela drives down that road, and both sets of people gather together to see him. The children, elated at the presence of one of their own, however fleeting, cheered, while the rugby players wore a pained expression of “This country’s going to the dogs”. That was the motif for the whole film, and such methods are constantly used to highlight the differences between the people (such as Mandela’s own security team and Francois Pienaar’s black maid). Sometimes, it’s nothing more than just a look of sorrow, but it is a look that tells a million words. 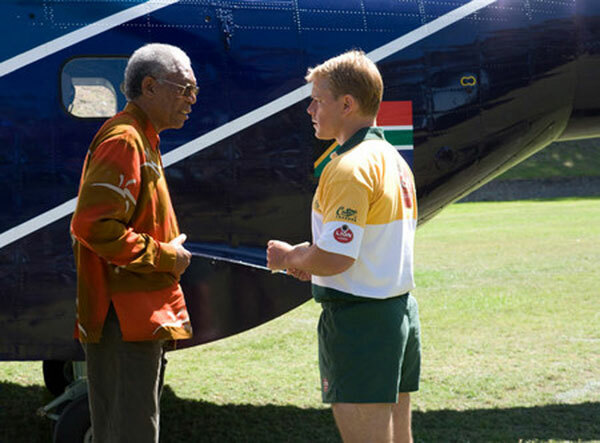 Nelson Mandela himself noted this in the film: “You see that?” he claimed, look at a television report of African kids enjoying a rugby clinic with the Springboks. “That picture is worth any number of speeches.” That is arguably the biggest strength of this movie: it’s ability to stick to the formula of a feel-good story. It might be a little bit bland, in some ways, and with a historical event (the 1995 World Cup) serving as the driving force of the movie, I wouldn’t say you’ll be necessarily surprised with ‘Invictus’ (though moments from the Robben Island trip the team took caught me off guard). It doesn’t mean that you won’t enjoy it, though; there’s a good chance of that happening, even if you’re not into rugby yourself. I mentioned earlier that in addition to making movies, Clint Eastwood has also mastered the art of timing his movies to near-perfection. With South Africa about to host Africa’s first football World Cup in just a few months time, I think he just about hit the home run with this one. If, of course, the football fan in me may be allowed to use a baseball term to describe this rugby movie as such, that is. Fikri thought Marguerite Wheatley was Eva Green, though he hearts her no less.